In the first three blanks, type or neatly print your full name, your Oregon driver license or state identification number, and the date of your birth. List your relationship (grandmother, etc.) to the children, then list the full names of the children and their dates of birth. These children must be living with you. State the address where you all live. 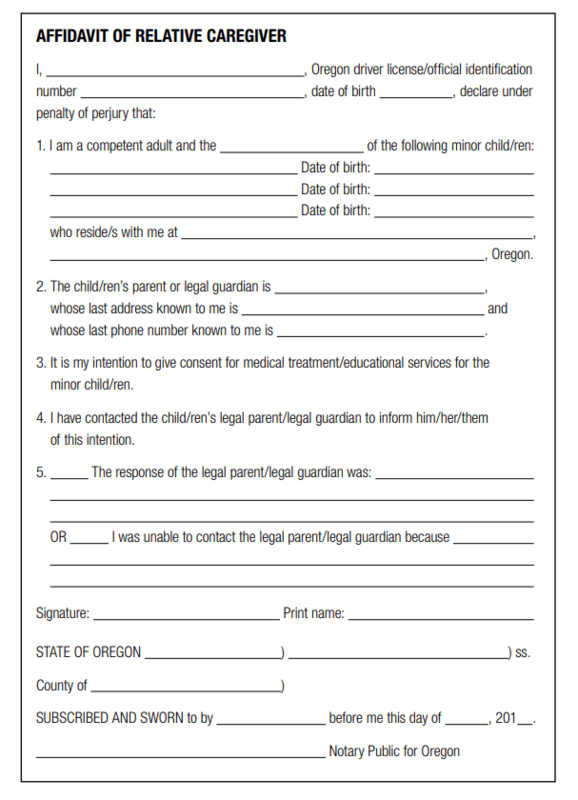 List the full name of at least one of the legal parents or legal guardians of the children, and that person’s last known address and phone number. Put your initials on the short line before the person’s response when you contacted him or her or them or, if you couldn’t locate the person, put your initials on the short line before that information. Sign this document before an Oregon notary. Be sure to have picture identification with you.